Dr. Stieglitz loves what he does. He’s good at it, too, and not just as a doctor, but also as a researcher. Based at University of California at San Francisco, the physician-scientist is studying a rare and deadly blood cancer called JMML, or juvenile myelomonocytic leukemia. JMML affects babies and toddlers, and the only known cure is a complete stem cell transplant, also known as a bone marrow transplant. This brutally intense treatment involves replacing diseased blood cells with healthy cells from a donor. Unfortunately, that doesn’t always work. 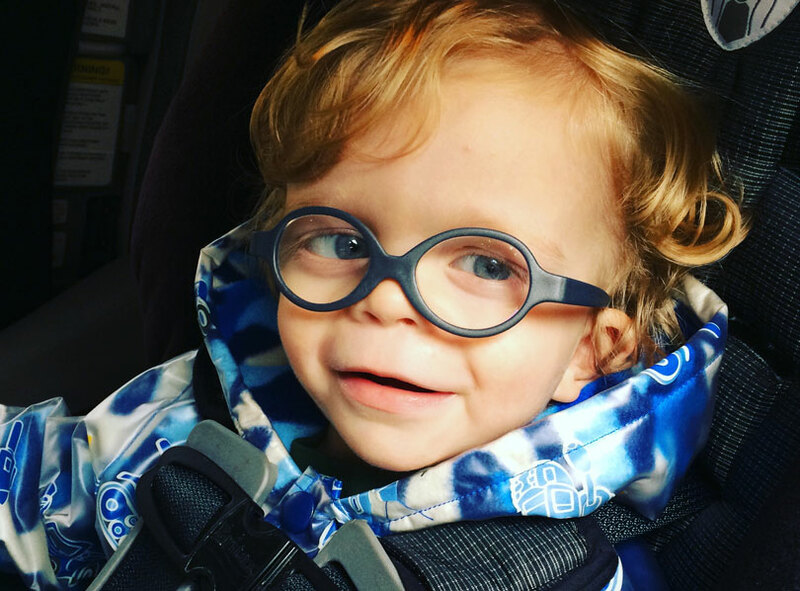 Ezra was diagnosed JMML when he was 4 months old and is now in remission. Read about how a certain genetic disorder may have saved his life. “Even with the stem cell transplant, which is the most intensive form of chemotherapy, half of all children with JMML will relapse, meaning their leukemia will come back after treatment,” he explained. For the other half of kids, the stem cell transplant is effective, with some even spontaneously getting better with very little treatment. Exactly why this happens is a mystery. But like many scientists, Dr. Stieglitz is a big fan of puzzles. He wanted to figure out why this happens, then use that information to help kids with JMML. What scientists do know about JMML is that the disease is caused by mutations in a certain set of genes called the RAS pathway. 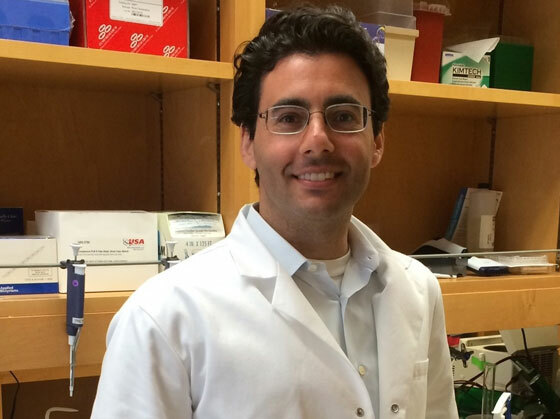 But Dr. Stieglitz discovered that there’s much more to JMML than those mutations in the RAS pathway, and his discovery is shedding light on why some kids do well after transplant and why some relapse. 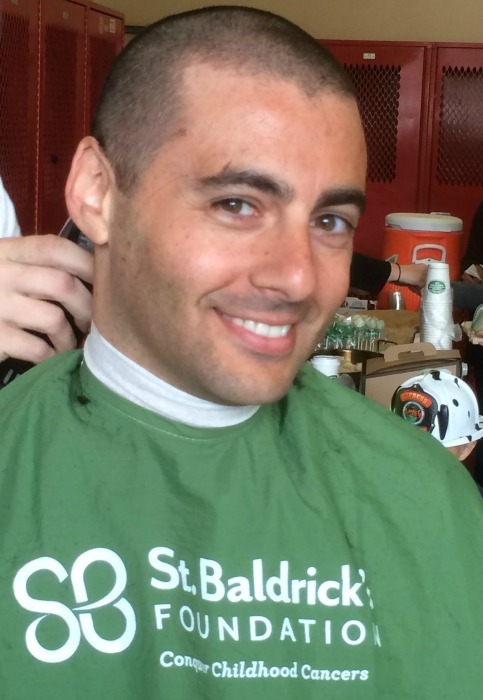 Dr. Stieglitz smiles with a newly bald head after shaving with St. Baldrick’s. “What we learned is that although mutations in the RAS pathway give rise to the leukemia, it’s actually the children who develop mutations outside of the RAS pathway that make the leukemia become stronger and relapse after treatment,” Dr. Stieglitz said. How did Dr. Stieglitz figure this out? He gathered the DNA from 100 patients with JMML and then examined every single letter of DNA in the genes that create proteins. “For all 100 patients, I read the letters of the DNA inside of the tumor cell. And for comparison, I also read the letters of DNA inside of the healthy cell, like from a swab of the cheek,” he said. It took him three long years. But it was worth it. In the past, he explained, every kid with JMML was treated the same — with a stem cell transplant. Now, for the first time, doctors can start to predict which patients with JMML are going to do poorly with conventional treatment and which patients are going to do well. So, depending on what a kid’s DNA says, doctors can now intensify treatments for the kids at higher risk of relapse and scale back on treatments for kids at lower risk, causing fewer long-term effects down the road. Also, those mutations outside the RAS pathway could possibly be targeted with new therapies. Dr. Stieglitz’s work has since grown from these first discoveries, and there’s even more excitement on the horizon. He’s currently working to unravel the secrets of a particularly nasty mutation found in kids with JMML who don’t respond to treatment. That mutation can also be found in other cancers, both in kids and adults, so whatever Dr. Stieglitz finds could have a big impact beyond JMML. Dr. Stieglitz will also be leading an important clinical trial five years in the making — the first of its kind in the United States — for children with relapsed JMML. Plus, he just received a coveted K08 grant from the National Institutes of Health, which will support his research for five years and is a crucial step toward becoming an independent researcher. This was all possible because St. Baldrick’s took a leap and funded a new researcher who didn’t have a lot of publications under his belt at the time, but who did have a big heart, determination, and a lot of great ideas.